NRG Steering Wheel - Collector Series UNIVERSAL - Dezod Motorsports Inc - Home of the automotive performance enthusiast since 2002. The Collector Series Steering wheel is the perfect wheel for auto tuners who wants the identical look or feel of the OEM steering wheels in the market. Leather and elegant chrome finish to complete that aggressive look inside the cockpit. These units provide the best style in both quality and durability. 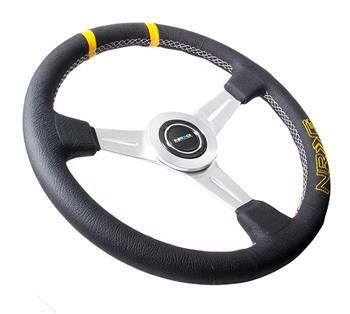 NRG steering wheels are sure to give your vehicle that extra edge of control and look to match your lifestyle.